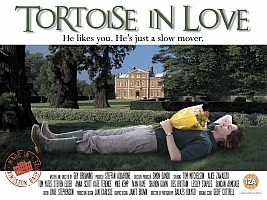 Made on a shoestring budget in the sleepy Oxfordshire village of Kingston Bagpuize, and featuring an unknown cast incorporating local residents, humorist Guy Browning’s airy-fairy rom-com Tortoise in Love (2011) undoubtedly has a great deal of goodwill on its side. Unfortunately, amateurish performances, turgid dialogue and a sexist streak more at home in the dark days of 1970s dismantle this admirably-funded project from the inside out. The film’s titular tortoise-of-sorts is Hugh Grant-clone Tom (Tom Mitchelson), a dim-witted gardener who has returned home to care for the grounds of a rich land-owner. Renowned across the village for his glacial pace when it comes to matters of the heart, Tom predictably falls head over heels in love when he meets Polish au pair Anya (Alice Zawadski). With the assistance (or should that be interference) of what seems like the entire Kingston Bagpuize populace, Tom strives to overcome his crippling shyness in order to win the heart of the Eastern European belle. Were it not for its meagre resources, Browning would have no excuse for this highly derivative, Curtis-by-numbers debut film. From the word go, everything about Tortoise in Love screams irksome English whimsy – from allotments to fetes, bumbling buffoonery to Blighty-fied bunting. Central protagonist Tom is the clearest example of this tried-and-tested approach to depicting Englishness on-screen – a mawkish man-child with a heart of gold and a brain the size of an onion bulb – which makes one realise just how good in this sort of role Hugh Grant was. Most surprising (and disappointing) about Tortoise in Love is its abject, one-dimensional portrayal of the sexes. Not since the On the Buses cycle has a band of such unattractive, idiotic and downright lecherous men demanded such attention from a fawning female supporting cast, whose sole requirement seems to be serving cakes and flirting with geriatrics. On the male side, women are once again vaunted as ‘mysterious creatures’ with which to do battle. During a scene at the annual village fete, one outraged bystander decries one of the featured games as “the worst kind of sexism”. “Agreed”, comes the inaudible telepathic reply from the watching audience. With a screenplay that makes the BBC’s The Vicar of Dibley read like Shakespearean prose and a sexual morality as suspect as anything you’ll coming out of Hollywood studios see this year, Tortoise in Love is a pungent red herring, a fatally unfunny comedy that’s neither warm nor enchanting.